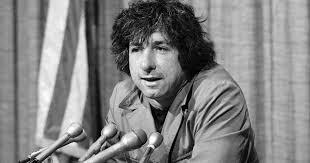 As an old SDS-er, I found it hard to see Tom Hayden go. However meandering his path, he was at the heart of radical history in the 60s, an erstwhile companion, if not always a comrade, on the route of every boomer lefty. One of his finer moments for me, which I’ve never seen mentioned (including among this week’s encomia) since he wrote it, was his 2006 article, published on CounterPunch with an introduction by Alexander Cockburn, in which he apologized for a “descent into moral ambiguity and realpolitick that still haunts me today.” It would be respectful of Hayden’s admirers and critics, on the occasion of his passing, to remember which of his actions “haunted” him the most. The title of the article says it clearly: “I Was Israel’s Dupe.” In the essay, Hayden apologizes for his support of the Israeli invasion of Lebanon in 1982, which was for him that “descent into moral ambiguity” More importantly, he explains why he did it, in a detailed narrative that everyone should read. Whatever else he did—and he was never particularly radical about Palestine—this article was a genuinely honest and unusual intervention, and it deserves a lot more notice—as a moment in Tom Hayden’s history and that of the American left—than it has got. Looking back and regretfully acknowledging that one had been duped and morally compromised by what seemed the least troublesome path 25 years earlier, saying “I woulda, shoulda, coulda done the right thing,” is a haunting moment for anyone. Doing it in a way that exposes in detail how a foreign country constantly manipulates American elections over decades is worthy of everyone’s notice. I doubt Hillary and her Democratic supporters will have anything to say about this “interference “in American elections, even local and state. But I do hope many of those who are touched by the loss of Tom Hayden heed these words from him, and don’t wait another 25 years to overcome their “fear and confusion” about saying and doing the right thing regarding the crimes of Israel, troublesome as that might be.